A vigil was held Monday to honor the victims of the Orlando shooting at the Dr. P. Phillips Center for the Arts in the Florida city. 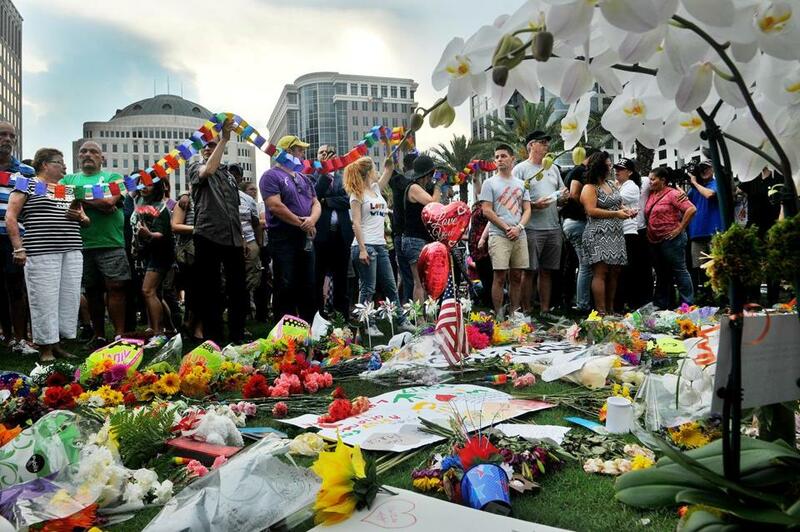 ORLANDO, Fla. — The murky picture of Orlando gunman Omar Mateen grew more complex Tuesday with word that the FBI is investigating whether he had been a regular at the gay dance club he attacked and had been living a secret life as a gay man. An official who was briefed on the progress of the case but insisted on anonymity to discuss a continuing investigation said authorities believe Mateen’s wife knew about the plot ahead of time, but they are reluctant to charge her on that basis alone. Some psychologists raised the possibility that Mateen was sexually conflicted and that those feelings might have contributed to his lashing out against gays. At a news conference at Orlando Regional Medical Center, shooting survivor Patience Carter described praying to die as she lay on a nightclub bathroom floor covered in water and blood. She said Mateen talked about wanting the U.S. to ‘‘stop bombing my country,’’ a possible reference to his father’s native Afghanistan. Gay dating app Jack’d said it has been unable to confirm so far that Mateen had a profile on the service. Grindr officials said they ‘‘will continue to cooperate with the authorities and do not comment on ongoing investigations.’’ And Adam4Adam said the company is looking at conversations and profiles in the Orlando area for any activity by Mateen but hasn’t found anything yet. Mateen’s father, Seddique Mateen, denied his son was gay and said that if he had been in the nightclub before, he may have been ‘‘scouting the place.’’ The elder Mateen, who lives Port St. Lucie, Florida, said that apart from the time his son got angry a few months ago over seeing two men kissing, he never saw any anti-gay behavior from him. ‘‘People who are struggling to come to terms with their sexual identity do at times react to that by doing the exact opposite, which could be to become more masculine or more vocal about their ideals of a traditional family,’’ said Michael Newcomb, a Northwestern University psychologist. ‘‘I feel like it’s a side of him or a part of him that he lived but probably didn’t want everybody to know about,’’ she said. The FBI has recovered Mateen’s phone and will use location data to verify whether he previously visited the club, said a third official, who was not authorized to discuss the case and spoke on condition of anonymity. Investigators working to determine whether anyone had advance knowledge of the attack have spoken extensively with Mateen’s wife, Noor Salman, and are working to establish whether she and Mateen were recently at or inside the club, the official said. The official said investigators have not ruled out charging others, including the wife. Associated Press writers Eric Tucker in Washington; Allen Breed, Mike Schneider and Tamara Lush in Orlando; and photographers Chris O'Meara in Orlando and Alan Diaz in Fort Pierce contributed to this report.